Do you long to have more time in your day? Do you wish you had enough time to check off everything on your to-do list? Do you feel like you will never catch up, like there is always something that needs to be done? As a wife, mom to six young children, homeschooler, business owner, animal owner and then some…I know how it feels to look at the endless task list you set and wonder how on earth you are supposed to accomplish all that. How does one person make all these things happen in a day? The thing is…God only gave us twenty-four hours in a day. If He wanted us to accomplish the amount of tasks it should take us thirty six hours to complete, He would have given us thirty-six hours in a day. Right? Are you surprised? Not what you expected? What does “productivity” mean to you? Most people will say something like…finishing everything on my to-do list for the day, completing all my daily tasks etc. Honestly, when was the last time you thought, “I’m so productive that I got it all done.” and didn’t have to wake up and do it all over again? Doing less will help you accomplish more. What if productivity was not about getting the everything done, but about getting your priorities done? What if productivity was not about doing it all, but doing the things we love and want to do? What if productivity was not about doing it fast, but doing it well? I am the first to admit that I have a hard time with this. I don’t want to disappoint and I do have a heart to serve, so I say yes. Then, I find myself stressed and burned out. I have learned that I need to say no for my own sanity as well as the well being of my family. People will learn to respect your decision. What is most important to you? What is most important to your family? What things feed your soul? What things drain you? I realize there are some things you need to do that you may not love, that’s just life. But, can you remove things from your day that really aren’t a priority? Learn how to become unbusy. Without rest, you will not be at your best. You can not pour from an empty cup. You are less creative and motivated when you don’t rest. Just stop and rest. You are worth it. Your family will thank you. The thought that you need to multitask is a myth. It is better to concentrate on one task, and one task only. Multitasking can actually inhibit productivity and create un-needed anxiety. When we concentrate on doing more than one thing, at one time, there is no way we can do them all well. Do one thing and do it well. Then, decide if you truly need to move on to the next task, and do only that task well. Decide what or WHO measures your truth worth. Your worth is not determined by your to-do list or how many task you cross off your list. That is not what you want to be remembered by, is it? There is someone far greater than all of us…and He measures our worth by what is in our heart. You are worth more, know that. You are worth more than a hectic, task filled day that never seems to have an end. More is not the answer. There will always be more to do. Choose less and do it well. Choose less and focus on what is important. Yes! Less is more. I’ve often considered this in regards to the verse that says He won’t put more on us than we can bear, but… we can surely put more on OURSELVES than we can bear. We can’t do it all and be everything to everyone! Have a wonderful Friday, Terryn! Absolutely! I’ve been battling the feeling of self worth and what I can/should get done each day. And I’ve recently discovered that I’ve been battling post partum depression. So, one of my new goals is to only plan 3-5 tasks for each morning to complete in a day. So far, it’s working great. Oh Mindy, I know that feeling all too well. I have battled some depression after this last baby, and postpartum anxiety after a few of my others. It is not an easy road, but I praise you for recognizing something that can help you. Doing less is all the more important when you need to focus on taking care of yourself. If you ever need someone to talk to, I would be happy to! Learning to say no is my most difficult challenge. This is a great idea. I am always terrible at saying no but really need to work on it. I have been trying to focus more on priorities lately and it’s been so helpful! I realllllly need to take your advice!! I often look at my “to-do” list with 20+ items on it and go “uhhhh when will it ALL be done”! I love the idea of choosing PRIORITIES and then doing “less” to get more done. I think rather than feeling tied down to that darn list I could whip through it a lot faster in the end! YES YES YES YES YES!! I often call myself the multi-tasker extraordinaire but sometimes, I have to remember that’s not always a good thing and trying to do MORE can often lead to tasks taking longer than necessary. Less is definitely more! Love these tips! I totally agree! I definitely have moments of overwhelm about my to do list. But when I started saying no and practicing self-care, I realized that I was happier and I was doing more of what I enjoyed. My business is growing more slowly, but I’m enjoying the process more. I am so guilty of forgetting this, ALL THE TIME! I need to be better about taking a step back sometimes. I really need to get better at saying no. It’s so hard because I don’t want to miss any opportunities! YES! Such great tips — and SAYING YES TO LESS is definitely the best way to stay on top of your priorities!! Great post. Love the tips!! Less is more and sleep is everything!! ALL the applause to saying “No!” Once I started taking control back and I accepted that it’s ok to say no I felt so much less stress. I hated feeling like I always had to say yes to everything and everyone. Sometimes I just need to control my own time. I am going to have to try this less is more thing…I seem to keep adding to my list, not shortening it! All hail saying “no!” Some of my friends don’t understand why I say no to so many things. It’s because I want to do the few things I enjoy really well. It’s huge asset to productivity AND performance! Great post! Friends tell me this all the time and after reading this I think I will start listening as well as actually trying to do less. Thanks for sharing! I love this, I am working on ‘less is more’. It’s s true! this is so so true! I’ve never thought about it that way but I totally agree with You! great read! Great tips. I get overwhelmed with how much I have to do. Learning to say no is something I need to work on! What an awesome post! I’ve learned that saying no to certain projects is honestly what’s best sometimes. I’ve always been one to say yes to everything, but I’ve learned I’m more productive and give better work when I say no to things that aren’t necessarily important. Yes!!! I am so bad at this…I keep telling myself I’m going to lessen my load each day, but then it always seems to build back up again. You are so right with all these tips! LOVE this! Definitely not what I was expecting, but so, so true! I Rome wasn’t built in a day, as they say, and the things on your to-do list don’t have to be done in one day either. Like you said – prioritize! It will get done… and sometimes that means taking a rest. Couldn’t agree more! I love this! I am currently so overwhelmed by my to do list! I need to figure out my priorities and then learn to say no to certain things! I have been thinking (and writing) a lot about this lately. It’s simply impossible to do all the things I can think of to do in a day. I especially love the last tip of making sure you keep in check where you get your self-worth. It’s so easy to get wrapped up in likes and pageviews (especially as a blogger), but at the end of the day, my worth comes from a much higher authority. Thanks! Saying no is something I’ve been trying to work on! This is a great post! I cannot agree with you more on this post! I recently decreased the amount of daily promo threads I participate in and focus on two or three on a daily basis. It’s helped me not only be more present in my kids’ lives, but appreciate the freedom to do other things. Oh, and it’s also kept me more organized. We are taught and expected to multitask all our lives, but your comment ‘first things first’ is on point! Things usually get completed with half the quality when multitasking. My goal for today is to focus on one task at a time. Yes to all of this! I’ve been working on cutting down the number of items I put on my to-do list and making sure I don’t overload it with tasks that I can’t accomplish in a day. I completely agree with everything you say here. I’ve been working on cutting down my to-do list. Some things just don’t need to get done (at least by me). Great post! Reevaluating and learning to say no! Yes, yes, and YES! Every once in a while I have to evaluate hobbies or items in the house. Learning to say no stops me from overloading my schedule. Taking on too much puts me at an overwhelmed standstill soon enough. I realized I needed less in my time with blogging by not posting so frequently. That helped me free up time and focus on family. You have really good points here. I think it’s important to reevaluate your to-do list, like you said, and prioritize. It really helps you clear your head and stay focused on the important things. Good tips! I love these tips! I definitely need to learn to say no more often…it’s just so hard! Way to put things in perspective Terryn! While I do feel productive when I finish the things on my to-do list (I do love lists! ), if I have too much on my list then that is when I start feeling the anxiety creep in because I know I’ve spread myself too thin. I love that you point out that we have to prioritize because everything does not have the same value attached to it. I am so bad at saying No, that is something I know I need to work on. Great post! This seriously hits the nail on the head! So often I say yes to too many things and end up being so overwhelmed that it takes me longer to get started wasting valuable time. Time that I could have spent relaxed. Silly me. I LOVE that you came out and just said it! Ah I took me far too many years to realize the mantra less is more. So relevant to almost all aspects of life! Love this!! I am so bad about getting lazy on days off so this is perfect! Definitely needed to hear this today! I got off work and planned so much to do around the house. When I really thought about it, it was so overwhelming! Once I reduced my list to be actually manageable, I got so much more done! Less really is more! That’s definitely a refreshing way to look at a day’s work! 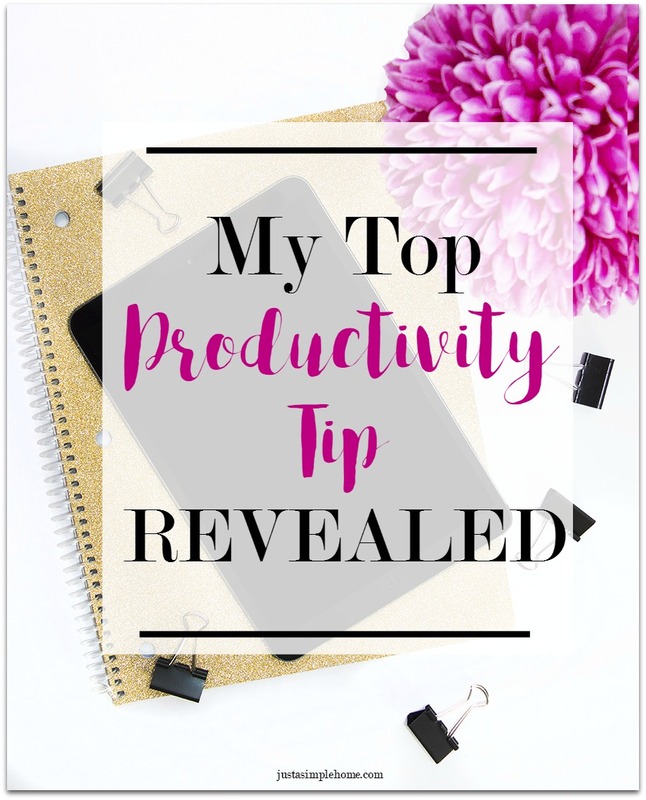 I always like to prioritize and work on one task at a time but I do get overwhelmed. Very good advice. The rest part is one that I think that gets missed a lot and saying no to things that are still great but not doable with other goals in mind. Love this. Great points!! Lately I’ve felt so overwhelmed, I’ve been trying super hard to prioritize what needs to get done. This can be such a hard lesson to learn. Last year my husband and I had to sit down and talk about my schedule; I was trying to do too much and everything was suffering. In the end we decided that a Bible Study that I loved need to go, even though it was good, it wasn’t really needed at that time in my life, nor was it something that I actually HAD to do. Totally agree with you! Very wise words! I really need to work on the rest component. A 15 minute nap can do me so much good, but I frequently try to fight through it imagining that I’m getting more done when in reality it’s totally unproductive time. Thanks for sharing. I’m visiting from Frog’s Lily Pad. Blessings! This is often the kind of advice that we do NOT want to hear. ha We’d rather there be a magical tool or organizer. But you are so right: doing less is the answer. It’s the same with clutter: instead of trying to organize it, just get rid of stuff! Thanks for sharing this hard truth with us. There’s a reason why they say, “Less is more”. I think once we get our priorities straight we will see all of those other things fall in place. Rest is a big thing! I always try to squeeze in a quick nap in the afternoons; I get a second wind and can focus more on what needs to be done. Terryn, Thanks for sharing with Thankful Thursdays, I hope to see you again next week. Thank you Lori! I agree with you completely, although I don’t get naps very often these days 🙂 Thanks for allowing me to share, I will see you next week! YES! Less is so much more. I am working on the NO right now. It’s silly how overwhelmed I was getting at such little things. Great post! Thank you so much Terryn for sharing this. I can’t tell you how much it helps to see that it is ok to say no and to rest! I am like you and I say “yes” to almost everything. Thank you so much for your encouragement. I love your blog. The tips are so practical. I needed this article today & I need to step up my NO game! Thank you so much!